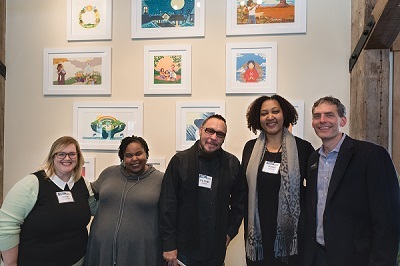 The Highlights Foundation unveiled our 2018 Visual Arts Exhibit on Saturday, March 17, with a reception at our Retreat Center honoring children’s illustrator Shadra Strickland. Ms. Strickland is the illustrator of more than a dozen books for young readers. Her latest picture book is A Child’s Book of Prayers and Blessings: From Faiths and Cultures Around the World (Simon & Schuster, 2017) with prayers compiled by Deloris Jordan. Ms. Strickland created nine spreads and 10 single-page illustrations using linocut, a unique hand-printed reduction linoleum printmaking technique. Original illustrations from Ms. Strickland’s book will remain displayed in the Barn throughout the year for visiting writers, illustrators, and guests to enjoy. 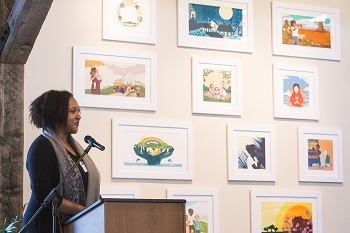 Ms. Strickland won the Ezra Jack Keats Award and the Coretta Scott King/John Steptoe New Talent Award in 2009 for her illustrations in Bird, written by Zetta Elliott. A year later, she won the NAACP Image Award as a contributor to Our Children Can Soar. Her illustrations for Loving vs. Virginia appeared in the 2016 Society of Illustrators juried exhibition of original artwork. “[In A Child’s Book of Prayers and Blessings] I focused on the things that connect us all: Things like nature, creativity, and celebrating our differences,” said Ms. Strickland. “Thank you, Shadra, for making the Highlights Foundation a more beautiful place to engage in the important craft of creating books for children,” said Ms. Green Myers. Download the event press release.